It was often the case in Japan that I would find KitKat variations that I would never purchase for one reason or another. Sometimes, it was because the flavor was a repeat, particularly strawberry or green tea varieties. At other times, it was because the variation was based on the packaging, size of the candy, or some other aspect rather than on the candy itself being different. That latter is the case with these products. 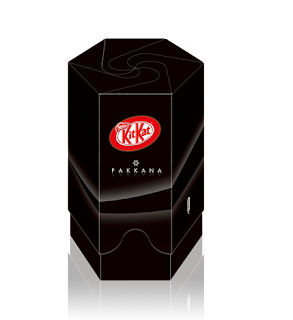 I'll be honest and say that I don't know what "Pakkana" means, but I'd guess that it's an onomatopoeia for the sound of something shaking in a box. I could be wrong, and I'm guessing that, if I am, the language-philes out there will pounce on me and let me know my grotesque inadequacy in no uncertain terms. 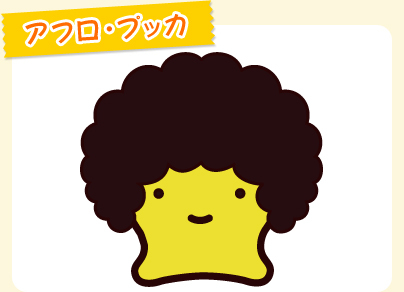 Images from Nestle Japan's site. Nestle Japan created a series of three boxes with 20 mini KitKats. There are 10 milk chocolate (regular) KitKats and 10 "adult sweetness" (semi-sweet chocolate) mini bars. 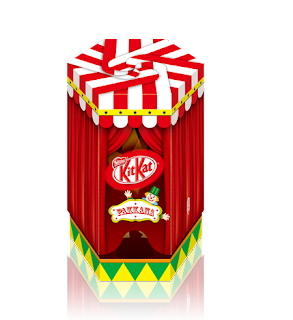 The first is a "circus" box which you shake lightly in order to get the clown to appear. 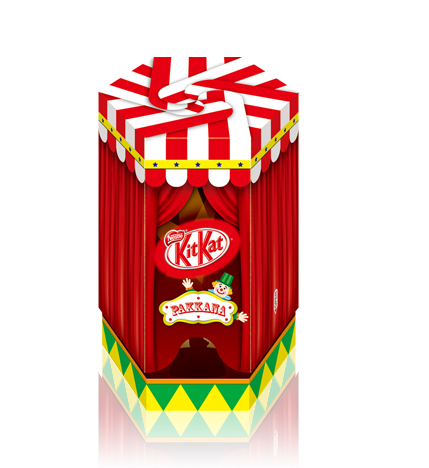 According to the blurb, this is to help you enjoy the circus along with the KitKat. This seems like it would appealr to the type of people who are easily distracted by shiny objects. The second design is a "cracker" design, and I don't mean the salted dry snacks that we enjoy spreading peanut butter on or garnishing with slabs of cheese. This is in the sense of a Christmas cracker. They claim in their blurb that having this on hand will enhance the image of a fun and lively party, if you're having a party. 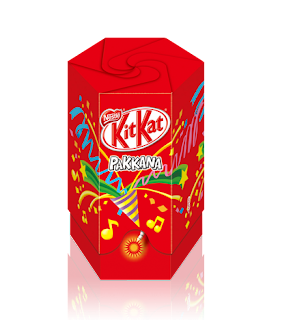 The final design is targeted toward sophisticates who think that boxes of KitKats can make attractive decorative pieces in their homes. This is called the "piano black" design and they encourage you to place it on your kitchen counter or in your office to impress people with your refined sensibilities. Of course, if you're that pretentious, I think you'd be better off parking a box of Godiva chocolates on your counter instead of KitKat minis. These are on sale for 630 yen ($7.91) per box and were introduced at the beginning of March while I was still living in Japan. However, I never saw them on sale anywhere and was around for about 3 weeks of their release. The web site does say that their availability is limited so you may have to look around a bit if you're a collector and just want the boxes. 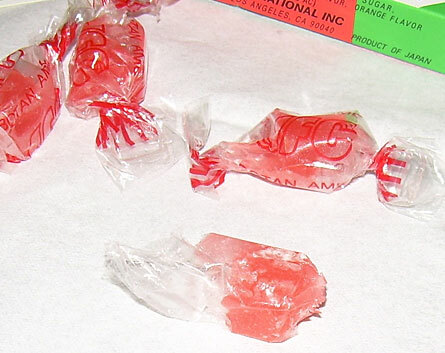 If you just want the candy, you can find the adult sweetness and regular bars anywhere and everywhere. These little packets of salted snacks, which resembled basic processed potato sticks like Pote-long, were on a variety of beer offered by Suntory. Chances are that they were using the beer as a way of introducing a new snack product rather than attempting to get people to buy the beer by giving them a free snack. Since I never saw them packaged and sold separately, I'm guessing the reception was less than warm and they decided not to push their processed barbecue potato sticks. If the Japanese were as infantile and competitive about trivial lifestyle choices as some Americans seem to be (e.g., "Coke vs. Pepsi" battles), there'd be one camp for Meiji's Pucca chocolate and pretzel combo and another for Glico's Pocky. On the Pucca side, there is a wafer-thin fish-shaped unsalted pretzel which has a buried treasure of creamy sweet filling inside. On the Pocky side, you have a similar pretzel rod coated in a sweet chocolate-based coating. What you like depends on personal tastes, but I've always loved Pucca and been relatively okay, but not had any particular passion, for Pocky. Since returning to America, I've seen Pocky a fair amount in run-of-the-mill supermarkets, but generally only in two flavors - regular chocolate and strawberry. They're also pretty expensive relative to the Japanese price, but I guess that is to expected since they are imports on this side of the planet. I've never reviewed either of these basic flavors, though some day I should. 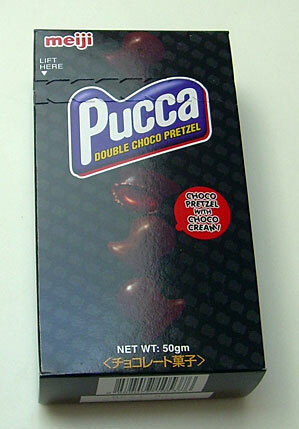 Pucca is a far more elusive catch, but I found this double chocolate flavor at the Daiso Japan in Mountain View, CA. It was not only a delight to find an old favorite on offer, but also very reasonably priced at $1.50. That beats the best Pocky price I've encountered by at least a buck. I checked Meiji's site for Pucca and they don't list this double chocolate variety as being available in Japan, though I'm sure it has been on offer at some point in the product's history. As an aside, I'll mention that "honey milk" is the only flavor on the site in addition to the regular chocolate kind in a plain pretzel wrapper. The box, which is multi-lingual and lists information in English, Chinese, and Arabic says that this was made in Singapore. The thing is, I'm not sure that the Pucca made for the Japanese market also isn't made in Singapore, Taiwan, or some other country in which labor is cheaper. It isn't uncommon for products in Japan to say, "made for (name of company)" rather than "made in Japan." The question is, is this the same sort of Pucca that I enjoyed in Japan and the answer is absolutely, "yes". The flavor of the chocolate is stronger than regular Pucca, as is to be expected with double chocolate. This masks some of the rye flour flavor of the pretzel (which I love), but that's okay because it gives back a slightly intense semi-sweet chocolate flavor. 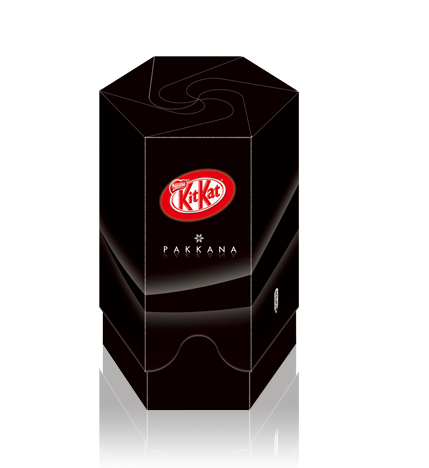 It even carries that familiar coffee-like aftertaste of Japanese chocolate that I know so very well. The center is creamy and smooth and, if you don't gobble this down too fast, it will melt decadently on your tongue. These are insanely fatty and eating the whole box of 18 thumbnail-size fish at once will set you back 264 calories. The flavor is so nice and strong though that I was satisfied after 4 or 5, though it would be easy to just consume them all. The good news is that I found an on-line resource for these which is economical and accessible to many. You can buy these from a place called eFood depot for $1.19 a box (cheaper than what I paid!) or a 4-pack for $4.60. They also carry Pocky and Pretz if your door swings that way. However, I'll stick with the Pucca. Image from Meiji's Pucca web site. There's a cute little character gallery showing Pucca characters made up in different ways on Meiji's Pucca web site (including a somewhat politically dubious "afro Pucca"). If you're into cute Japanese characters, you might want to give it a peek. Image from Morinaga's web site. On the Starship Enterprise, that's NCC-1701-D, not NCC-1701, you can imagine the ladies of Japanese descent wringing their hands and fretting about what to get Captain Picard for Valentine's Day this year. After all, the Japanese celebration of said holiday encourages women to give men chocolate rather than vice versa. 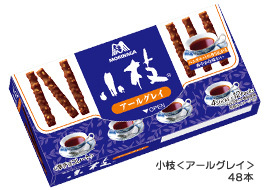 Well, Japanese women of the distant future, Morinaga has your back and is proving that it is ahead of the times by offering an Earl Grey variety of its popular twig chocolate. Instead of having his usual cuppa, he can munch on one of these crispy treats and remember you when promotion time rolls around. Of course, the women of the original Starship Enterprise had it easier as pleasing Captain Kirk was usually a simple matter of finding an alien babe of low moral fiber and setting them up for a coffee date. After that, nature would take its course and the Captain would be winking at you the next morning to let you know that you'd be moving ahead on the rankings in no time. The NCC-1701 was a swinging place and Captain Kirk didn't need a cup of Earl Grey to get his mojo started. Getting back to the matter at hand, I never reviewed Morinaga's Koeda (twig) chocolates because I tried them early on in my days in Japan and didn't really find them all that exciting. The chocolate tends to be on the soft side and not particularly exciting flavor-wise. I prefer chocolate with some good snap. They have little bits of almond in them and you'd think they'd have crispy bits, but they don't have enough to impart much of a strong almond flavor or a satisfying crunch. The "twig" name comes from the shape of the candy, which resembles the gnarly bark of trees in the eye's of some, and like something that may have come from a particular symmetrical bowel of an errant dog in the eyes of others. It wasn't on aesthetic grounds that I didn't have them, but simply that, while an adequate candy, they never really did it for me. They suffer from being rather insufferably boring, though the brand has been around for a very long time and I'm sure it has its fans. The earl grey flavor is a special summer variety and I'm sure it's meant to encourage people to enjoy a less "heavy" flavor in the heat. These are blended with bergamot to bring out the sense of Earl Grey, but even if I was able to buy this, I probably wouldn't. I tend to enjoy my tea best in liquid form. Click to load a larger image. I've been told that setsuden, or energy conservation, has not yet started in Japan and that it won't begin until "summer" starts in July or August because hot and super muggy weather in the mid to high 80's doesn't qualify as warm enough to kick on the air conditioning anyway. Let's say that I'm glad that I'm not spending another summer with air conditioners set at 28 degrees C./82 degrees F. in Tokyo. For those who want the illusion of coolness without the actual feeling, Tirol introduced a line of "Big Tirol Crystal" chocolates. The box design is supposed to bring to mind ice cubes and the flavor choices are, well, I think supposed to cool you off. The flavors are soft strawberry, sour lemon, and cool mint. I guess that you'd have to keep these in the freezer since setsuden would likely have them melting in a cabinet and eating cold chocolate would probably help you out as you melt in the boggy summer weather. "D-Plus" is not a grade, though by the end of this review, we'll see if there is a double-meaning to this product's maker's name. It stands for "day plus" which could mean a great many things or nothing at all. I'm told that using English names for products is just to make them seem cooler somehow. I think that it refers to the fact that these are "long life bread" products that last more than a day. I'm not sure, but I think this one was issued on May 25, and I bought it on June 11, so, that's quite a "plus" if my assumptions are correct. The company's web site says that these are designed to last up to 60 days, so this is about the middle-aged period of this bun's life. This is my first experience with this particular manufacturer of Japanese snacks and that is due to the fact that, as I mentioned in my post on Japanese bakeries, I rarely ate anpan (sweet bean jam buns) because I was never a fan of the hamburger-bun-like casings. The thing that changed all of that was having been away from Japan for 3 months and finding myself a bit on the "starved" side when it comes to anything with anko (sweet bean jam). 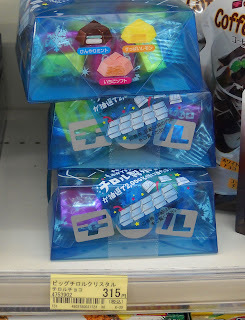 I found this at "Daiso Japan" in Mountain View, California and snapped it up in a fit of snack purchasing. For those who don't know, "Daiso" is a chain of 100-yen shops in Japan that has a few branches elsewhere. That place is essentially a transplant of the Japanese shops and even carried the same types of visors that I bought in Japan for pretty much the same price. Since everything in the Daiso Japan store is a $1.50 (120 yen), that's what I paid for this and it was pretty gratifying to be paying almost the same amount for this here as I would if I had picked it up in Tokyo. My experiences so far have shown that that is rare. Usually, things are at least 50% more expensive, if not double the price of those in Tokyo. The company that makes these is located in Gunma prefecture and has only been doing business since 2003. They take pride in using natural yeast germinated in brown rice and talk about how it produces lactobacillus cultures, though they also mention that the cultures are killed when the bread is baked so I'm not sure why they bother to mention it. It's like they're trying to add an aura of healthfulness to their products. I've had many experiences with packaged bread products and knew this wasn't going to be the greatest thing on earth. That's okay. Not everything I eat has to be the best of the best. In this case, I was really just looking at the experience of having anpan without tracking down a specialty bakery in the Bay Area. Also, for the price, one has to set ones expectations at the right place. One interesting thing about buying things in America is that I don't have to translate the ingredients or nutrition information. I've read kanji for years that say "fruit sugar" on them and have wondered if that was the way the Japanese say "high fructose corn syrup", but I know it could also be "grape sugar", which is a less nutritionally suspect substance. In the case of this cake, it is the dreaded HFCS. However, I'm not really the sort who gets worked up about that because I don't eat much processed food and don't drink sodas with sugar. I figure that I'm not in much danger with what little I do eat, but those who feel it is the devil's liquid refreshment may want to steer clear of anything in Japan saying "fruit sugar". One other odd thing about the translation is that it says the bun has 260 calories in the English information, but 288 in the Japanese information. 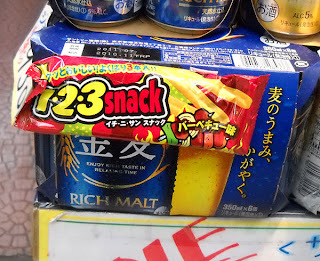 It seems that 28 calories were lost in translation. I tried half of the bun at room temperature straight out of the package. The bean jam is smooth, sweet, and very tasty, though it does tend to settle into a cake in the middle rather than distribute nicely throughout the bun. The bun, well, it wasn't terrible, but did taste like a day-old hamburger bun. It wasn't exactly stale, but it also wasn't exactly fresh tasting either. I ate the other half after putting it in the microwave for about 10 seconds. Sometimes, a little zap will freshen up dubious bread and I believe it did improve the overall texture a bit by softening it up. It was about 15% better with a bit of a warming. It's hard to render a verdict on this given my spotty access to such Japanese snacks. If I was deprived of anko snacks for a long time again, I'd certainly buy this again. In Tokyo, I loved manju that offered me a soft mochi wrapper around the bean jam and had all I could want from traditional sweets shops. Here, I'm in the "beggars can't be choosers" position. The bottom line is that I might buy this again, but only out of nostalgia for the taste of bean jam, but if I can find ready access to a better source, I wouldn't buy this again. It's not that it's so bad, but simply that the bread is not very good. During my many years in Japan, I would often happen across something from America that I had not seen regularly or for a prolonged period of time and get excited. Things like Oreo cookies and KitKats didn't really light my fire, but on the occasion that Dr. Pepper or a Butterfinger bar popped up, I'd feel happily nostalgic. This sort of gleeful return to the thrilling days of yesteryear diminished as the years went by as I forgot what I missed back home as the lights of my memory dimmed and more American food found its way into Japan. They became less novel with this increased encroachment. Now that I'm in America, I'm finding that the exact opposite is happening. Instead of being happy about American things, I'm searching for and thrilled to find the Japanese things that I'm familiar with. Sometimes they are the same, but more often than not, they are relabeled and packaged for the American market. It is rare to find something which has Japanese writing and an English label placed over it, much rare than things with English writing and Japanese labels were in Japan. One of my biggest surprises was stumbling across an Anderson's bakery in the Hillsdale shopping mall in San Mateo, California (that's right, I'm not in the San Juan islands anymore!). At first, I didn't know if it was the same chain as the ones in Tokyo that I was so familiar with, but a peak around the shop, a comparison of the logos, and an online search revealed that it was one and the same. Of course, the pastries that they offered were not the same as those in Japan for the most part, but some things were similar or the same. They both sell fruit danishes which look remarkably similar and anpan (sweet bean jam bun) as well as good quality bread. The biggest surprise to me though was that the California one sold melon pan, though they called it "Sunrise bread". since melon pan doesn't actually taste like melon, it probably helps them not mislead customers about what it tastes like. One of our greatest pleasures of living in Tokyo was picking a day once a week or so and going to a good bakery for a fresh pastry for breakfast. At the time, I often believed I "missed" American-style pastries and would be happy to come back and enjoy the danishes, especially the cream cheese ones. When I got back, things didn't quite turn out as planned. Most of the bakeries I've experienced offer gooey decadent monsters or over-sized muffins and cakes. Most things are too sweet for me and all are too big unless they are specifically marketed as "petit". The cinnamon rolls and similar offerings tend to be tough, dense, and slathered in frosting. 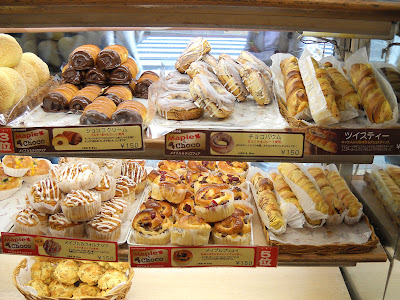 I've been incredibly disappointed in most of the bakeries so far and have found myself hoping to find the types of bakeries I used to frequent in Japan. I guess there is no pleasing some people. There are, generally speaking, two categories of bakeries in Japan. Note that I separate patisserie (cake shops) from "bakeries". To me, a "bakery" makes bread-based products with some types of cake, but mainly bread, donuts, and yeast-raised-based pastries. Patisserie made those fancy cakes that you could find at Cozy Corner and expensive shops. One kind of bakery is a very Japanese-style one which tends to focus on shoku-pan (soft almost cake-like, essentially a Japanese take on pain de mie) white bread with a high amount of sugar and fat) offerings. They sell anpan, sandwich bread, and sometimes various types of "cream bread", but the basic bread in these pastries tends to be much like a hot dog bun in the U.S. (though rather finer in texture). They also sell various other specialties, but most things are geared heavily toward Japanese tastes for lightly sweet, fatty, soft breads. You rarely, if ever, see a whole grain bread in such bakeries. These small bakeries are the most likely to disappoint foreign visitors because the bread is so lackluster and the sweets are neither interesting nor very sweet. In fact, I'm not sure that the majority of what such bakeries offered were baked on site. I often felt that they were getting their wares from places like Yamazaki pan, a major maker of pre-packaged baked goods in convenience stores. Some of the bread at these shops is sold wrapped in plastic, though not with any commercial labeling. It really does whiff of shelf-stable mass-produced bread which does not have its maker identified. 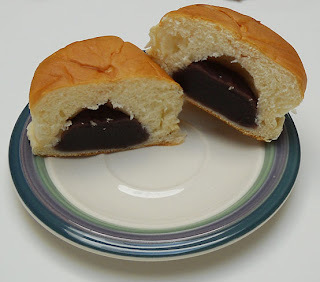 One of the reasons that I never developed a taste for commonly available anpan was that I didn't like the hamburger-bun-style consistency of most of the breads used to encase the sweetened bean jam. 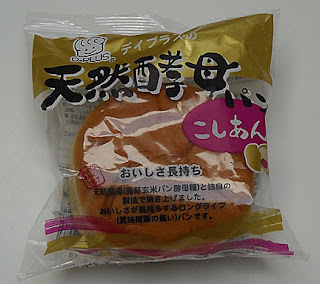 Note that anpan is not the same as manju, or traditional Japanese sweets, that are made with bean jam. The other common type of bakery is a European-style one. These are the types of bakeries that I loved in Tokyo. It's important to remember that Japan is not a culture with a heavy baking history and most of what is sold in bakeries comes courtesy of Germany, Denmark, Portugal, and, of course, France. German- and French-style are the most popular, but the plethora of castella options shows the Portuguese influence. Well, there is that and the fact that the Japanese word for bread, "pan", is actually the Portuguese word for bread. Orange croissants, on sale, at Saint Germain. This was one of the more reliable bakery options and it offered fantastic orange croissants and incredible cream bread. They also offer some of the best basic bread I had in Japan, especially crusty varieties with a tender middle. They also have a serviceable calzone, if you rely on enjoying the dough more than the filling (which was paltry). Their donuts were pretty poor though as they often seem to have been fried in oil that had seen better days. Saint Germain prepares its baked goods in the tradition of French bakeries, though it makes a banana bread that would make your grandma weep (no matter where you are from). They also offer samples more often and in larger sizes than nearly any other bakery. If you're hungry and strapped for cash, you might want to drop by and hope to beat the middle-aged ladies who descend upon them the minute they appear. Despite the name, this is the least European of Japan's European bakeries and I can't tell you how many times I went in for a browse and walked away empty-handed. I didn't know this when I was still living in Japan, but the chain is owned by Yamazaki Pan, which explains the fact that their baked items seemed so pedestrian. This is equivalent to a bakery being run by Entenmann's in America. Early on in my years in Japan, I loved one thing they had on offer, a baked potato with mayo wrapped in a freshly baked French-style bread bun. I'm sure it was pure poison, but I loved it and sometimes bought one as my lunch. They tend to carry a lot of seasonal items including apple and green tea pastries. They also had more pastries with cream filling than any other bakery, and despite my love of such things, they rarely appealed to me. All of that being said, I also used to buy their melon pan regularly and they were the bakery that got me hooked. Dragone is a pretty small chain which seemed to constantly be opening and closing locations (and I couldn't find a web page for them). One of my husband's students once bought 5000 yen (about $60) worth of their famous mochi bread because she thought it was so awesome. She left it in her bicycle basket while she stepped into another shop and someone stole it. Because of her ringing endorsement, we went to Dragone and tried their bread, croissants, and cake. All of it was underwhelming. The main point of their bread is that it's supposed to be chewy, but we found it all too dense and not especially flavorful. Hands down, this French-style bakery had the most incredible bread in Tokyo. It is frequently located in the basement of department stores, and almost always has a long line snaking through heavily trafficked locations. You can't go wrong with anything they offer and they have a wide range of sweets and breads. They make one of the best anpan because the bread is reliably good, and the version which has both bean jam and cream is a decadent treat. Most Japanese bakeries, even the good ones, do a pretty rotten job with scones but Pompadour's are quite good. Edy's is a chain of bakeries located in JR (Japan Railway) stations. Despite the fact that they seem to be pretty mass market, they are a good bakery and one of the more unique and enjoyable items is a cream-filled donut-style pastry covered with cornflakes and powdered sugar on the outside. You have to get it while it's very fresh, but if you do, it is incredible. This bakery, which is also mainly located in department stores but also has some independent shops, makes the best scones in Tokyo. One of my favorites was their cranberry orange scones. They are small, crispy on the outside and coated with coarse sugar, and delicately textured on the inside. They are so perfect that no jam, butter or other accouterments are necessary. They also make a super egg tart with a perfect crust and a rich filling that is not too sweet. 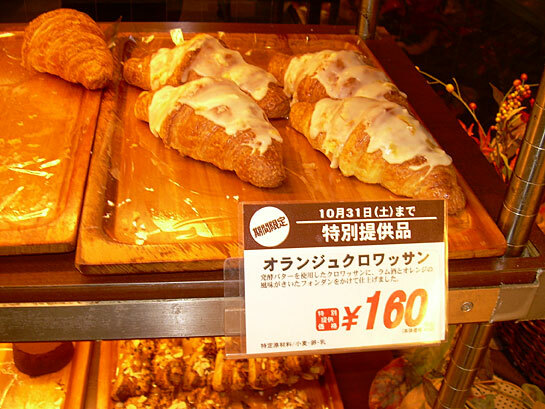 Hokuo is a Scandinavian bakery and often these shops are small and near major stations. My favorites were the maple bread, which features delicately sweet but flavorful veins of maple throughout cake-like bread and a flaky roll pastry with whipped cream and chocolate coating. The latter is often stored in the refrigerator case. Hokuo also had some pretty serviceable bread and was good for sales of the end pieces in large bags as well as reduced prices at the end of the day at some shops. They also have a very nice cranberry bread. I probably went into Antendo more than most bakeries because my husband was in love with their banana muffins. These muffins had a strong banana flavor and were just sweet enough. 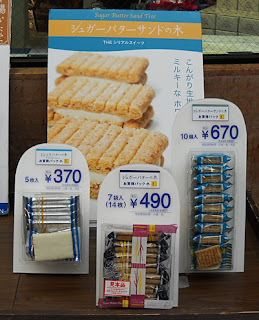 They also seemed to be made with real butter, which is relatively uncommon in Japan. Most of the time, margarine is used in baked goods. Unfortunately many of the other items at Antendo suffered from being "too bready" as my husband would say. They were short on their flavor elements (like chocolate, maple, even bean jam) and big on bread. It's not that their bread was bad, but it wasn't incredible. Pompadour could get away with that, but Antendo couldn't in our experience. 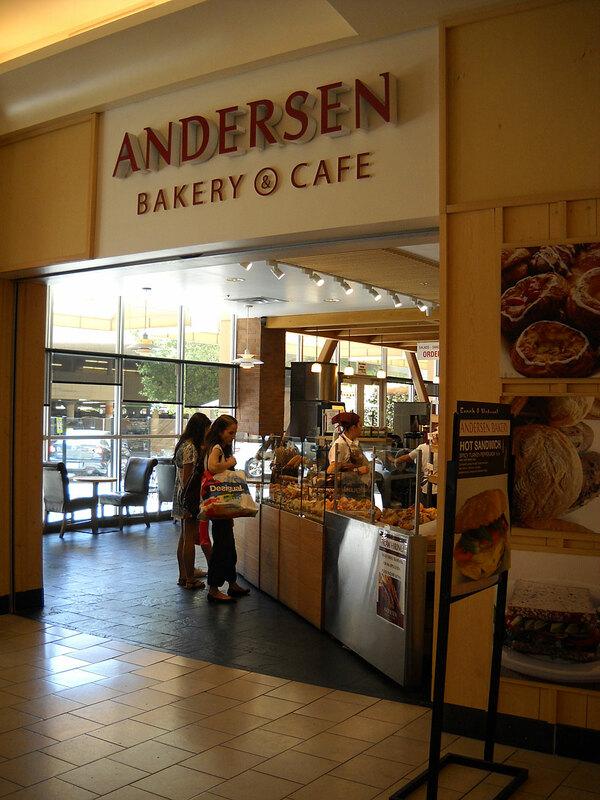 As I mentioned before, Anderson has bakeries not only in Japan, but also in the U.S. and Denmark (and it is a Danish-style bakery). The truth is that most of my experience with Anderson came from visiting their cafe when I was working. Occasionally, my husband and I would buy their sandwiches, which were served on French bread and had a few thin slices of ham and cheese. Their bread is quite good, but not much else that they sold lit my fire. They had some of the softest melon pan in Japan, and the best melon pan is crispy on the outside with a light coating of sugar. In my opinion, among these major chain bakeries, the best for bread is Pompadour. For pastries, we liked Saint Germain, but also Edy's. 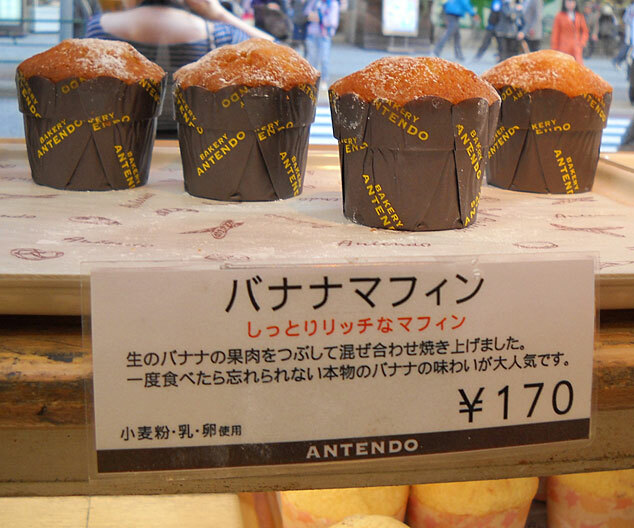 Almost no bakery in Japan reliably does muffins well, but Antendo did quite well in general. Oddly, none of the major bakeries regularly carried amashoku and small ones rarely did so either. You had to happen upon an independent bakery that offered them. Note that most Japanese bakeries do a pretty bad job with scones (often hard, dense and rock-like) and we generally avoided them. And also, please remember that this is not an exhaustive list, but just an overview of major chains that people are more likely to find. There are plenty of good local bakeries and other chains to sample. I used to think that the bakeries in Japan were lacking, but now I think that many were quite good. However, none of them are a catch-all for one-stop shopping. If you know where to look for the best version of whatever a shop sells though, you can enjoy some of the best baked goods in the world. When I left Japan, my Japanese friends and students were incredibly generous toward me. I will forever be touched by their gestures and generosity. Many people gave me snacks because they are the sort of thing that they knew I'd enjoy, but also because food gifts are very common in Japan in general. 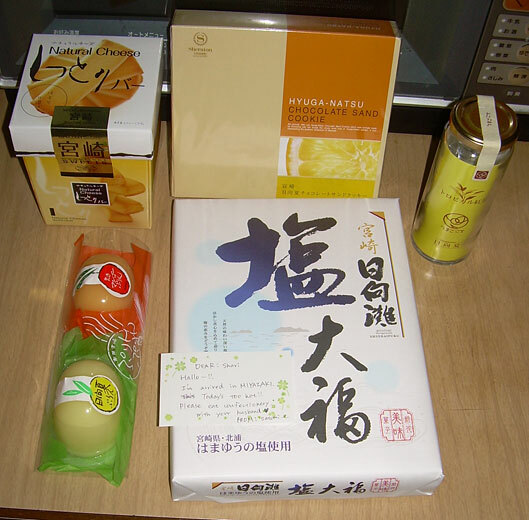 The picture above was a "care package" that a student sent to me from her home town during my final week in Tokyo. Her home area is Miyazaki and she had given me a hyuga-natsu fruit and cookies before and I loved both. She gave me these as other souvenirs of her home area. From lower left clockwise, these are: hyuga-natsu and mango "jellies" (like a cross between gelatin and pudding), natural cheese cookies, hyuganatsu sandwich cookies, hyuga-natsu tea (delicious and tangy), and mochi sweets filled with red bean paste (daifuku). I drank the tea since I had a cold the last week that I was there and ate the pudding, but took the rest home with me to enjoy during my first month back. If you visit Japan and have a chance to sample some hyuga-natsu treats, I definitely recommend giving them a try. One of my favorite candies in Japan was Bontan Ame. This candy, which resembles fruit jelly candies, is widely available in Japan and considered rather old-fashioned. One of the main features is that it comes with an edible wrapper to protect your fingers from getting too sticky off of the gummy/jelly-like candy. They are covered in a type of material which is frequently used on capsules used for medicine. The first thing I noticed was that the edible wrapper on this is a much more pleasant experience than the one you get with bontan ame. Where bontan ame turns a bit glue-like and melts a little slowly, this dissolves fast and is hardly noticeable. I always was anxious for the wrapper to get out of my way with the Japanese candies, but I hardly noticed it here. The second point I noticed was that the flavor is much more orange-like than bontan ame. The outside is also slightly crispy, though not really hard. As it warms up, it gets softer and chewier. It's sweet, but not overwhelmingly so and has a pleasant flavor in general tinged with a bit of a floury aftertaste. I imagine this comes from the cornstarch. The flavorings include both lemon and orange. I loved this and could see eating an entire box in one sitting without hesitation. One box is only 80 calories, but it is also only 6 small pieces. With the price being about $2 (240 yen) per box in American markets (I've seen it in several), this is a financial indulgence. Since a box with 14 pieces of a similar size can be bought in Japan for a mere 100 yen ($1.20), I can't help but feel that this is exorbitantly priced. Of course, you do get a children's sticker which says "printed in Japan" on it, but I hardly think that is worth the extra cost. The interesting thing for me about experiencing this candy is that it is an import to America from Japan. That explains, at least in part, why it's so expensive since labor costs in Japan are hardly cheap. That being said, I don't understand why Japanese bontan ame has orderly little cubes stacked in the box such that you can get 14 in it and this has a helter skelter sampling of 6 bits with plastic wrapping. Do Americans demand the extra wrapping at the expense of volume? It seems hardly likely. The company that imports these is called JFC International, and they are responsible for a wide variety of Asian food distribution world-wide. Their web site indicates that they handle over 15,000 products and some of the most popular ones are Japanese. This is no surprise since Japanese cuisine is positively regarded worldwide, and a lot of what might be seen as "exotic" flavors 20 years ago are available even in some remote areas. I was surprised to find tonkatsu sauce in the small rural area I lived on in the San Juan islands, for example. Personally, I'm hoping to get a line on the oil-less sesame dressing that is featured on their front page at present. 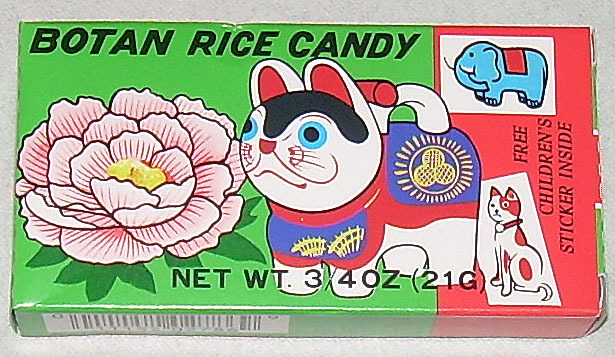 I used to buy that in Japan all of the time and loved it. I would definitely buy these again, but not at Safeway supermarket where I paid too much. I would, however, order a 12-pack for $9.51 at Amazon. It's still more expensive than Bontan Ame in Japan because it is a smaller portion, but at least it drops below a dollar a box. I would caution those who know the Japanese domestic product that this is a little sweeter and lacking in the hint of sourness. It's not overpoweringly sweet, but clearly these are not the same formula as Bontan Ame. They're still good though, and I recommend giving them a try. When I was living in Japan, one of the little things I enjoyed was sampling the various Mintia flavors. For those who may not recall, Mintia is the Japanese equivalent of a TicTac. 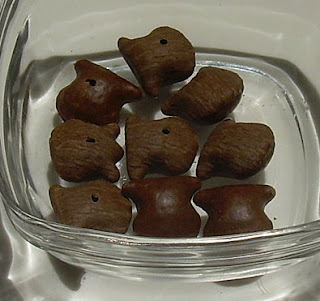 It's tiny little pellets, not necessarily mint-flavored, which I imagine are supposed to be handy for breath freshening, but that I generally kept around to get that lingering coffee taste out of my mouth or the weird aftertaste of Japanese chocolate. While I loved the creamy milk chocolate in Japan in general, it always did leave a funky taste on the tongue and a bit of Mintia went a long way. It also helps those with an oral fixation who would like not to apply it to other things in the presence of civilized company. In the last 6 months or so of my stay in Japan, I sampled a vast array of interesting Mintia flavors. I think I only reviewed a few here, but I sampled far more in my everyday life. In fact, one of my last acts of snack advocacy in Japan was to get my brother-in-law hooked on Mintia by sharing a mikan (Japanese tangerine) one with him shortly before we left. The advantage of tiny little mints like Asahi's Mintia and Lotte's Ice Breakers, which are the latter's attempt to slice out a piece of the Mintia market's pie, is that they provide a flavor pack for a low calorie and monetary cost. At an average price of about 100 yen ($1.20) per pack of 50 tiny little tablets, it's a pretty good deal. 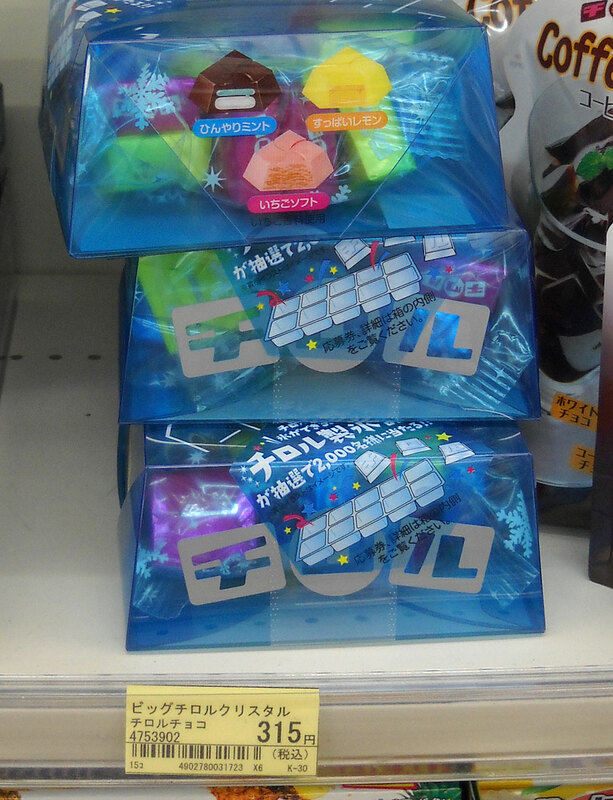 The difference between Mintia and Ice Breakers is that Lotte's offering comes in pretty boring flavors. They offer sour grape, sour green apple and sour lemon. Like Mintia, you get 50 little tablets per pack and they are sugar-free. While there isn't much in the way of sugar-free candy in Japan, gum and mints tend to be the exception because of the possibility of their causing tooth decay (not because of concerns about calories). Lotte, in what I can only imagine is an attempt to draw attention to a product which seems to be utterly lacking in imagination both in terms of presentation (same tablets, same packaging, same product as Mintia), and pedestrian flavors, is using a flamboyant actor named "Jonte Moaning" in the commercials. He's an interesting choice not because he was associated with Janet Jackson during his career, but because he is not too dissimilar from all of us other grunts who came to Japan and ended up teaching something. In his case, he taught dance in Hiroshima. There's an interesting interview with him here. I like how he laughs when the interviewer asserts that he is big in Japan. Many small time celebrities, musicians, and actors lie about being "big in Japan" in order to promote themselves and he seems to be acknowledging that their perception of him is a bit overblown. Prior to this promotion for Lotte, I never saw anything featuring him in Japan. Of course, I didn't watch much television (and actually still do not) and he could be the bee's knees in Japan and I might not know it. The commercial is currently available on Lotte's "CM" (what the Japanese call commercials) page. You can view it from this page by clicking on the appropriate thumbnail while it lasts. Note that the link won't be there forever as Lotte rotates out the commercials after the products get new promotions or are withdrawn from the market. They even have a Facebook page with a little under 70 "likes", which sort of makes me sad. Mintia has about 3,400 on theirs. 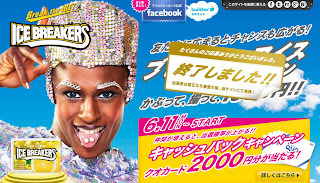 I wonder to what extent using Jonte Moaning in a very eye-catching (and slightly disturbing) commercial reminiscent of a less heterosexual Ruby Rhod in The Fifth Element will amp up their product recognition. It certainly made me take notice. I don't know if my readers think that I carefully select my random pictures from a distinct set of photos, but I can tell you that the process is, well, very "random". I have thousands of pictures from my time in Japan and I choose a folder and just poke around in one until I find something I want to show people. For reasons that I cannot begin to fathom, it is not infrequently the case that the random picture I stumble upon is related to a recent review. 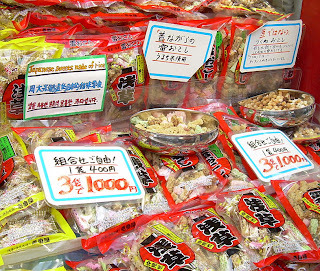 In this case, I reviewed a rice bar sandwich cookie on Monday and happened upon this picture of rice cereal sweets for sale in Asakusa. Perhaps the rivers of fate flow in a particular direction, or I'm just exercising selection recognition and fooling myself (likely the latter). Since breakfast cereal isn't very popular in Japan, it always seems odd that there are these cereal-based sweets though it really shouldn't since there is no reason why the Japanese can't puff or crisp rice for cereal as well as anyone else. 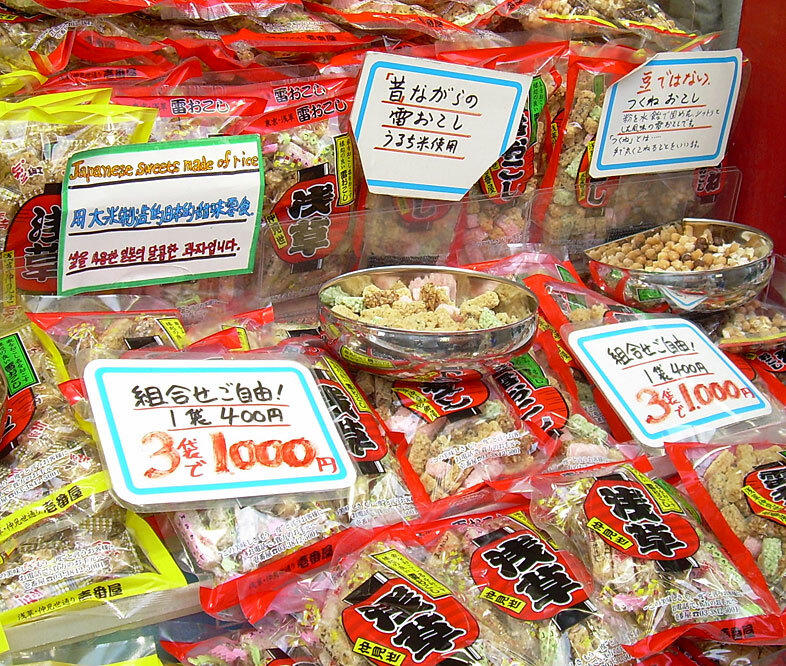 These bags of cereal snacks are blocks of crispy rice glued together with rice syrup. The silver bowls contain samples and this was an unusual display because there are actual economies of scale at play here. It was extremely rare to see any sort of meaningful price reduction for buying more in Japan. One bag is 400 yen and three bags are 1000 yen. That being said, I think that even at 333 1/3 yen per bag, these were overpriced. 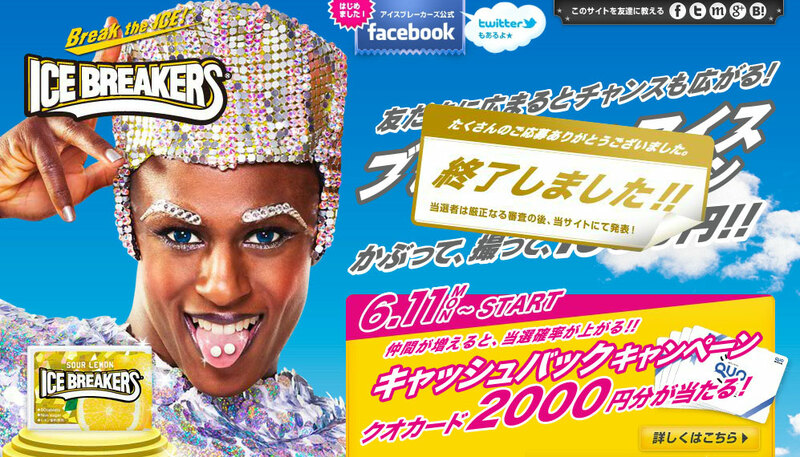 The tagline under this poster advertising "Sugar Butter Tree Sand" says, "the cereal sweets". I like how they use the definite article in English, as if they need to differentiate it from all of the other cereal sweets as the one and only. There is a category of snacks and sweets in Japan that I haven't really seen in the United States which this particular snack falls into. Granted, I've been back in the U.S. for only two months and I've spent that time largely on one small island with two stores in the San Juan Islands, but I'm not sure that I'm wrong when I say that there is a layer of snacking in Japan that lies between what you buy at the local market or convenience store (like a KitKat) and what you buy in a department store (e.g., Godiva or Leonidas chocolates). The closest I can come to something akin to this in the U.S. is the Whitman's Sampler, though that's probably a low-rent purchase compared to the sort of mid-priced, elegantly packaged type of food that is sold in Japan. In general, I'm talking about the sort of thing you might buy for someone else, but are unlikely to buy for yourself and which is not a regional souvenir food gift. My feeling is that this level of snacks exists because of the way in which gift-giving operates in Japanese society. There is a fairly big niche market which does not exist in American culture because they lubricate their social relationships with nicely wrapped parcels containing atypical delights. If you visit your in-laws or have a reunion with your childhood piano teacher, these types of snacks are one of the more appropriate offerings. The "Sugar Butter Tree" line (by Ginnobudo) falls into this category. They aren't pedestrian, but they also aren't high class. They're just right to show respect, but not to embarrass the recipient or the giver with an ostentatious display of a big label or an indication that you inappropriately spent a lot of money based on your relative statuses. No, you save ostentatious displays of wasted cash for your valued clients or sucking up to the boss. Image taken from Ginnobudo's site, because my infamous issues with taking pictures of light/white food ensured that my picture pretty much sucked. It's important not to confuse the nice packaging and the high price tag with some sort of amazing gustatory experience. I've had a lot of these types of snacks and they are surprisingly pedestrian in their tastes. 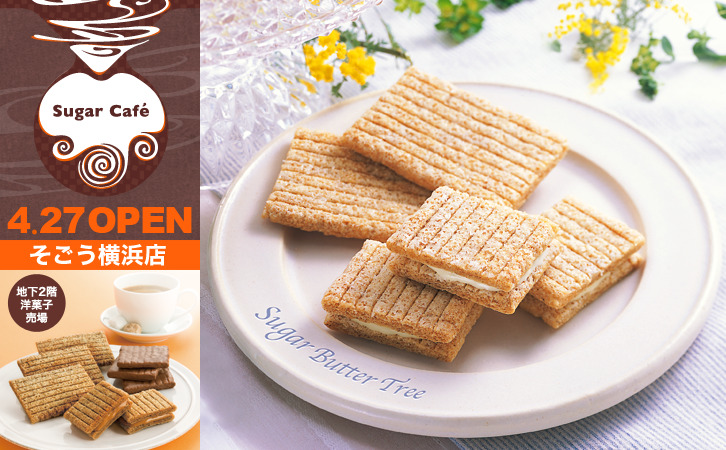 In fact, one of the reasons I wanted to review the "Sugar Butter Tree Sand(wich)" cookie is that it really is a classy, modified version of a Rice Krispies treat. It lacks the marshmallow component so it is not gooey and sticky, but it does taste an awful lot like a version of said cereal with a white chocolate filling that packs a sweetness punch. The crispy cookie planks are even slightly soft like the infamous cereal treats. There is a funky flavor to them which I might identify as fake vanilla, but I think is actually something about the white chocolate used in the filling. My husband bought a box of 10 of these cookies and it took us a very long time to eat them. It wasn't that they weren't relatively decent as a snack. It's merely that they weren't all that spectacular and, at about 80 calories each, we often felt we'd rather "spend" those empty calories somewhere else. Still, I think that curiosity seekers and Rice Krispies treats fans who can't get their fix in Japan may want to give them a try. At the very least, you could buy them as a hostess gift if you go to a Japanese person's home as they'd likely fit the bill without embarrassing yourself or the host. The offerings for Happy Meals toys in Japan at this time cater to both cute-o-philes and car lovers. All images pilfered from McDonald's Japan's web site. There has been a lot of hand-wringing and teeth-gnashing in the United States over the past decade or so about nutrition. The devil in most cases is luring you beneath the yellow arches and trying to convince you to inflate your belly and clog your arteries with his salty, fatty patties and starchy fried sticks of death. Nowhere is there more concern than when it comes to what is marketed toward children and what their parents purchase for them. Won't somebody please think of the children! In America, the way in which the children have been thought of has encompassed a variety of changes at McDonald's including offering sliced apples instead of fries and soda being replaced by milk (low-fat, naturally). For reasons that I'm sure are logical to people who actually have children, they also decided that toys had to be taken out of American Happy Meals. Perhaps, they want to be sure that kids aren't nearly as happy as they could be about a Happy Meal and are therefore less likely to want one. Certainly, no one thinks that the toys are making kids fat, do they? Well, maybe they do. Sometimes the logic of some people escapes me and, for all I know, plastic crap made in China may be transmitting contact calories. I had several discussions with various Japanese people with children about food at McDonald's and the "Happy Meals" in particular. Incidentally, "Happy Meals" are called a "Happy Set" in Japan. By no means are the people i spoke with a representative sample of parents and their opinions of McDonald's food or the inclusion of toys with said sets. However, the fact that the toys were displayed prominently in front of my local Mickey D's for years would seem to be an anecdotal indication that there wasn't a public outcry against using them to market fast food to innocents. As for what my conversations seemed to reveal, not one person felt that toys were the proverbial apple leading children out of the gustatory Eden of traditional Japanese cuisine. While they did believe that the toys may make kids want to buy the meals in order to get the toys, they said that it was the parents responsibility to make a choice about what to do. In fact, they said that, if they wanted the toys for the kids, they could simply buy the food to get the toy and throw the food away if they were so worried about the nutritional content of fast food. Indeed, many of the parents felt the kids weren't all that interested in the food in many cases anyway. Menu options for a "happy set" in Japan. Click to see a larger, more legible version. The usual "happy set" in Japan does not offer the same "healthy" options as American "Happy Meals". In fact, it arguably offers less healthy options as you can choose from among a hamburger, cheese burger, chicken nuggets of small ("petit") pancakes as the main part of the meal. I can only imagine the cries of protest if pancakes were to be an option in America. As the side dish, one can choose fries or sweet corn and the drink options are any small beverage including soft drinks, tea, milk, juice, and milkshakes. Of course, you can also choose a toy option. Currently, people can have "Hello Kitty" toys or "Voov" miniature vehicles. The 15-second promotional commercials for these toys are very stereotypical in that only little boys are shown with the cars and mainly little girls are with the kitty-chan toys. You can view these commercials on the lower right hand side of the "Happy Set" page at present (but I'm sure they'll vanish in the future after this promotion ends). (Warning: Subjective conclusions and editorial commentary ahead!) One of the things that I concluded about living in Japan is that overall food culture as opposed to specific aspects of that culture is extremely powerful in shaping the health and bodies of the people and that the causes of the lifestyle problems in the U.S. which relate to lifestyle diseases (heart disease, diabetes, etc.) are not the result of the presence of unhealthy or fast food. There is a load of equally unhealthy food in Japan. When Americans try to fix childhood obesity by offering kids apples instead of fries, milk instead of soda, and taking away their toys, they're fixing a broken finger by putting a band-aid on a stubbed toe. Sure, they're both on the body, but one doesn't fix the other. The problem isn't the presence of empty calories being marketed with things kids will nag their parents to get them. The issue is an overall food culture that sees the frequency and volume as such things as being much higher than can support a healthy body. The Japanese, at least for the time being, are still in a place food culture-wise where they don't eat too much of such things too often. Parents don't care about the contents of a Happy Meal/Set because they care about food otherwise. They're not looking at taking their kid's to fast food places often enough for it to be an issue. They're looking at the whole day and entire composition of their children's diet. That's not to say that they never will care, nor that obesity rates aren't increasing in Japan, too (they are). However, for now, the kids can keep their toys, their fries, and even have pancakes if they want them and no one is going to scream "won't somebody please think of the children!"